The models show a baby-faced young man with chubby cheeks and his family's characteristic overbite, a weak chin and a pronounced, sloping nose beneath an elongated scalp. Three teams of scientists have created the first facial reconstructions of King Tutankhamun based on CT scans of his mummy. The images are strikingly similar both to each other and to ancient portraits of the boy pharaoh, including his depiction on the famed golden mask he wore into the crypt. The teams - from France, the United States and Egypt - each built a model of the pharaoh's face based on some 1,700 high-resolution images from CT scans to reveal what he looked like the day he died nearly 3,300 years ago. The models, photos of which were released Tuesday, bear a strong resemblance to the gold mask of King Tut found in his tomb in 1922 by the British excavation led by Howard Carter. The beardless youth depicted in the model created by a French team has soft features, a sloping nose and a weak chin - and the overbite, which archaeologists have long believed was a trait shared by other kings in Tut's 18th dynasty. His eyes are highlighted by thick eyeliner. "The shape of the face and skull are remarkably similar to a famous image of Tutankhamun as a child where he was shown as the sun god at dawn rising from a lotus blossom," said Zahi Hawass, secretary-general of Egypt's Supreme Council of Antiquities. The CT scans - the first done on an Egyptian mummy - have suggested King Tut was a healthy, yet slightly built 19-year-old, standing 5-feet-6 at the time of his death. The three teams created their reconstructions separately - the Americans and French working from a plastic skull, the Egyptians working directly from the CT scans, which could distinguish different densities of soft tissue and bone. The French and Egyptians knew they were recreating King Tut, but the Americans were not even told where the skull was from, yet correctly identified it as a Caucasoid North African, the council said in a statement. The French and American models, seen in photos released by the council, are similar - with the Americans' plaster model sharing the more realistic, French silicone version's receding chin and prominent upper lip. 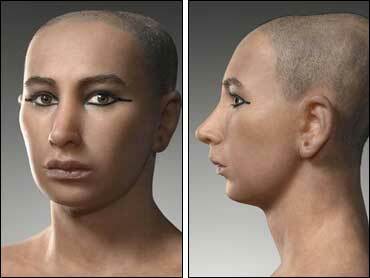 The Egyptian reconstruction has a more prominent nose and a stronger jaw and chin. The tests provided an unprecedented look at Egypt's most famous mummy - but they did not resolve the mystery of the death of King Tut, who came to power at age 9. They were able to dismiss a long held theory that Tut, who died around 1323 B.C., was murdered by a blow to his skull or killed in an accident that crushed his chest. It raised a new possibility for the cause of death: Some experts on the scanning team said it appeared Tut broke his left thigh severely - puncturing his skin - just days before his death, and the break could have caused an infection. The life of Tutankhamun - believed to have been the 12th ruler of ancient Egypt's 18th dynasty - has fascinated people since his tomb was discovered in 1922, revealing a trove of fabulous treasures in gold and precious stones that showed the wealth and craftsmanship of the pharaonic court. Hawass is leading a five-year project to scan all of Egypt's known mummies - including royal mummies now exhibited at the Cairo Museum. Eventually, each mummy will be displayed alongside CT images and a facial reconstruction.